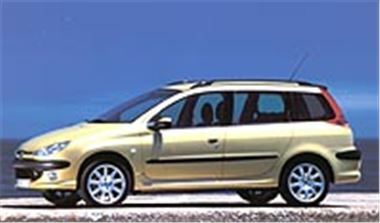 Hot on the heels of its 7-seat 306 SW, Peugeot is launching a station wagon version of the 206 to go on sale in the UK in summer 2002. An extra 190mm of length combined with a flat loadspace floor gives it 28% more luggage capacity than the 206 hatchback. While, very handy for shopping or for carrying long items, the rear window opens independently of the tailgate. Loads can be kept in check by a strong mesh net and a pull-out load cover keeps valuables unseen by prying eyes. An optional folding passenger seat increases interior versatility. Standard roof bars can be fitted with transverse bars to carry up to 75kg. Rear passengers benefit from greater legroom and headroom than in the 206 hatchback. Engines will be the same 1.1, 1.4 and 1.6 litre petrol and 1.4 or 2.0 litre HDII diesels, though the 1.4 diesel will not be available in the UK until October 2002. Standard safety features include ABS, EBD, SMART driver and passenger airbags and five lap/diagonal seatbelts.